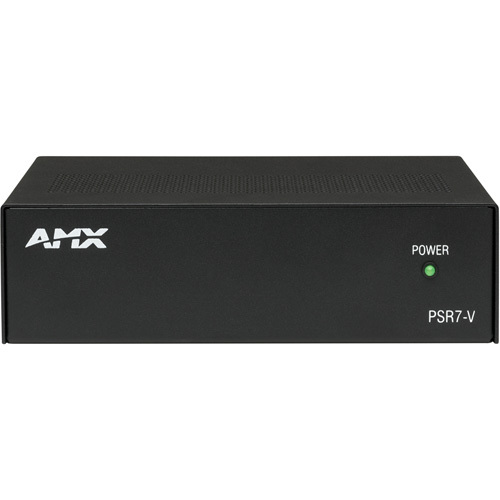 The PSR7-V power supply provides 7 amps of 12VDC power and is an optional power supply for Modero® X Series line of touch panels and NetLinx NX Integrated Central Controllers. It includes three 3.5 mm phoenix connector with retention screws. Accessories include a V-style module rack tray and surface mount brackets which allow the PSR7-V power supply to be securely mounted to flat surfaces such as under a table or on a wall. Up to three power supplies can be mounted side-by-side using a 1 RU space. Ideal for professional AV installations, the PSR7-V power supply helps to protect valuable components against over-voltage, over-current, short-circuit, transient and thermal damage. Protection - Against over-voltage, over-current, short-circuit, transient and thermal; switching regulated and overload protected.